Radjah, which means “king” or “prince” in Hindi, may seem like an odd name for a duck. But the radjah shelduck Radjah radjah is no ordinary waterfowl. The radjah shelduck’s unusual coloration sets it apart—with its pale pink bill and feet; its white head, neck, and breast; its dark chestnut-colored collar/breast band; green bands on its chestnut-colored wing tops (seen in flight); its dark rear and tail; and the white iris of its distinctive eyes. 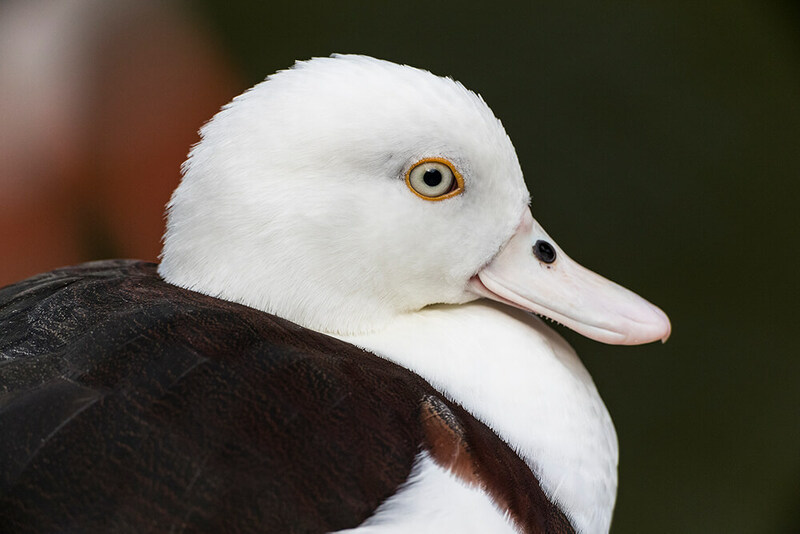 If you’re from Australia, you might refer to this eye-catching bird as a Burdekin duck, named for the Burdekin River in Queensland. And some people substitute the word “sheldrake” for shelduck (both words mean “pied or dappled waterfowl”). But whatever you call it, this is one unusual bird. At just under 2 feet (61 centimeters) in length and weighing about 2 pounds (1 kilogram), web-footed Radjah shelducks are strong swimmers that can make their way very quickly across a body of water—however, they are usually found in shallows with just 2 inches (5 centimeters) of water or less. And while they are skilled fliers that have been described as being more like geese than ducks, they are equally good runners, capable of swiftly traversing a muddy bank. Radjah shelducks live in forest and coastline areas of northern Australia, from Queensland to the Northern Territory and the Kimberley in Western Australia, the Moluccas islands of Indonesia, and New Guinea. Radjah shelducks can be found in brackish mangroves and paperbark tree swamps, or in freshwater wetlands, lagoons, and billabongs. There, they forage for food and eat mollusks, insects, algae, and sedges—and occasionally small fish, crabs, larvae, and seeds.) They use their bill to filter through the water and scoop up food. These birds feed mainly at night, grazing or dabbling in shallow water, grasslands, and mudflats. During the wet season, November through April, radjah shelducks establish breeding grounds, and the males become very aggressive in defending them. When radjah shelducks mate, they remain monogamous and form long-term pair bonds. The pair will scout out a place to nest that is near good locations for finding food, often in a tree hollow. They build their nest out of their own soft down feathers, using no other materials. The female will lay a clutch of 6 to 12 cream-colored eggs by May or June, and she will incubate them for about 30 days, until they hatch. The new chicks are covered with down, with black markings, white spots, and a dark chestnut crown that extends to the eyes. Both the male and female care for and raise the young birds. The youngsters fledge in about 50 days, but they will stay with their parents until the dry season begins. During the dry season, May through October, radjah shelducks form flocks and fly off together in search of small ponds. Radjah shelducks are featured at the San Diego Zoo Safari Park’s new Walkabout Australia exhibit, which opened in May 2018. Radjah shelducks are protected by law throughout Australia. Populations are considered to be stable, however the species faces a variety of threats in the wild, including habitat loss, habitat fragmentation, and illegal hunting. Some Australians call radjah shelducks “Burdekin ducks,” named for the Burdekin River in Queensland. Radjah shelducks are skilled fliers, and they are also surprisingly good runners, capable of swiftly traversing a muddy bank. Juvenile radjah shelducks have similar coloration to adults.